The Latin American celebration Día de los Muertos, or Day of the Dead, is celebrated during the same time frame as Halloween. Both events are centered on traditions rooted in acknowledging the deceased. Although mostly different, a few characteristics of both holidays make them similar -- helping to explain why confusion between the two exist. Halloween occurs on October 31. The Day of the Dead actually spans two days. November 1 is the day when deceased children are honored; this is referred to as the Day of the Innocents. November 2 is the celebration to honor deceased adults, known as the Day of the Dead. Both days are combined to form the celebration that collectively is called the Day of the Dead. Both Halloween and Day of the Dead use costumes as a way to express the celebration. Halloween costumes can range from scary to fun. To dress for the Day of the Dead, children don masks to represent the deceased, in an honorable way, sometimes wearing the masks in a parade held in celebration of those who have passed on. Both Halloween and the Day of the Dead use food as part of the celebration. 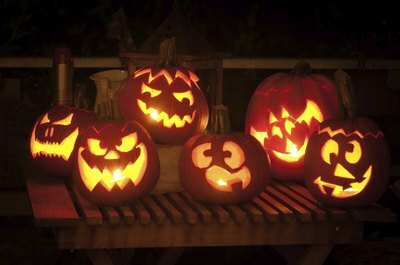 Halloween involves trick-or-treating where children knock on doors to receive candy, sweets and treats. 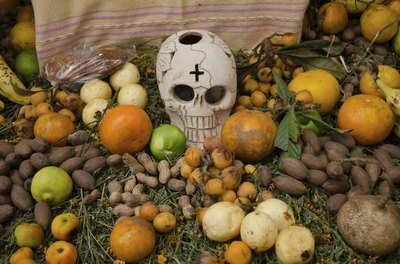 Although food also is used during Day of the Dead, the food is placed on altars at the grave sites of those being remembered during the holiday. In the days and weeks before Day of the Deed, graves are cleaned and prepared for the festivities. In contrast, the faint of heart avoid graves during Halloween. Both holidays use ghosts and spirits in celebrations. Halloween tends to use a more morbid and ghostly approach to the dead when it comes to celebrating, with costumes and decorations centered on skeletons, zombies and monsters. Skeletons are used in Day of the Dead activities, although usage is based more in honor of the departed. 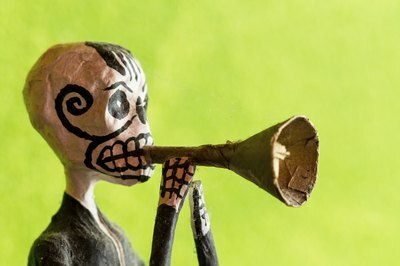 Both traditions share an emphasis on the deceased, but Halloween participants use the departed as a means to scare while the Day of the Dead celebrants use the dead as a form of remembrance. 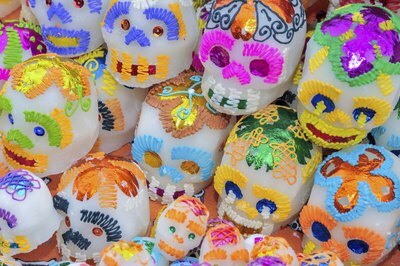 What Happens When the Day of the Dead Is Celebrated?